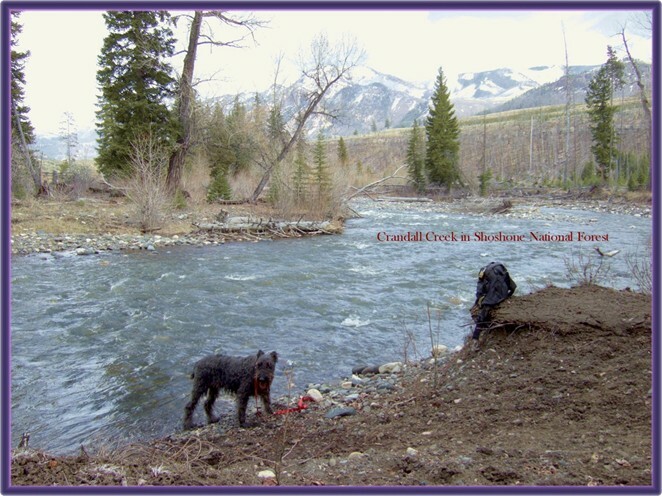 Mariah (below left) standing along the bank of Crandall Creek in Shoshone National Forest. 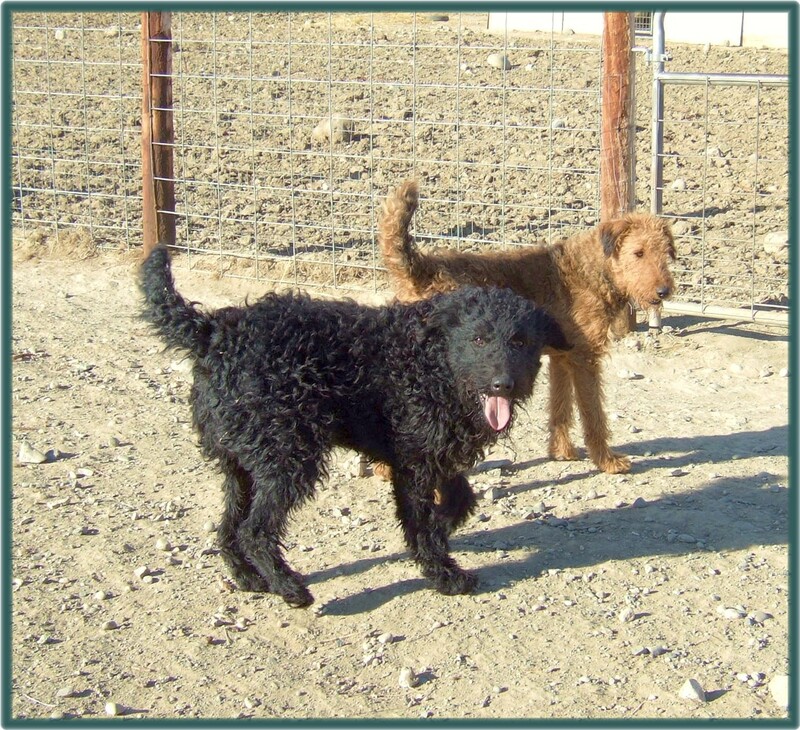 Possessing a highly intelligent and happy personality, Black Magic (right) with Shadow (red Airedale). Black Magic stands about 27 inches tall at the shoulder. 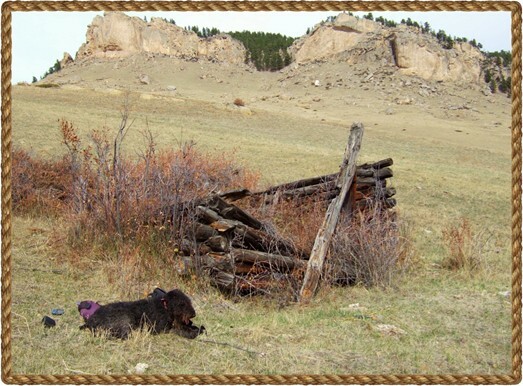 Photos of my black Airedale Mariah relaxing next to an old dugout in the Bighorn Mountains (below) and laying by Sunlight Creek in the Beartooth Mountains (right). She travels very well and has spent many nights with me in motel rooms throughout Wyoming for more distant projects. She also likes to go camping in the mountains. Possessing considerable stamina for rough terrain, Airedales love to hike. Our Airedales are purebreds, not crossed with other breeds such as Labrador or Irish Terrier, etc. to produce the red and black colorations. We have DNA proof on Roc our original black Airedale and Fancy Girl. 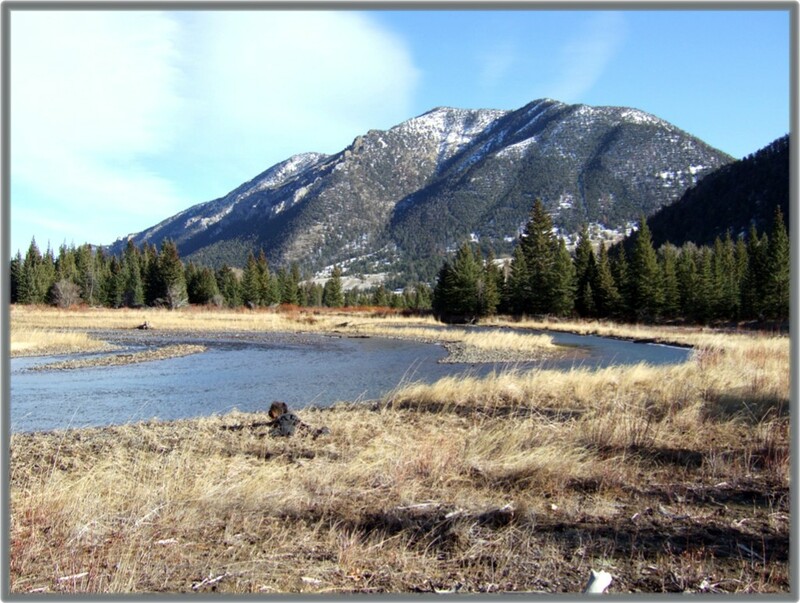 Our field assistant Black Magic is Roc's great-grandson. Many of the black Airedales exhibit some red or mahogany coloration in the beard while and the occasional small, white patch or crest on the upper chest. A few of these dogs display a faint reddish tinge on their coats. On very rare occasions, two black & tan Airedales (registered purebreds) will produce a black puppy. In the past, the breeders often either sold the black pup without papers or put the pup down trying to keep the incident a secret. Please feel free to phone us at 307 754-3426 or email us at airedale@tritel.net for more info.